My younger children attended a neighbor’s birthday party this weekend at a local farm called North Run. Beautiful place. Each year, they do a corn maze that is in the image of something rather extraordinary. I believe the first year they designed a blue crab; another year, they patterned GO RAVENS with a Ravens helmet. This year, their eighth in cutting designer corn mazes, they created an elaborate statue of liberty. I never even knew they were there (located just off of Greenspring Valley Road). What we found, though, was an autumnal gold mine, complete with a genuine pumpkin patch (they bring large branch cutters to help you cut your pumpkins when you’ve made your choice), hay rides, a hay field playground, and a petting/feeding zoo with chickens, pigs, sheep, goats, and cows. They also have a store filled with fresh produce and homemade jams and preserves. Most important, though, was the friendly and kind demeanor of everybody who worked there, from the owners to the seasonal help. My kids and I were treated wonderfully from beginning to end. I took the above picture while my kids were in the pumpkin patch, making new memories to kick off the autumn season, our favorite time of year. I hope each of you can afford a few hours in the coming weekends to stop by your local farms to partake in a little seasonal relaxation. Have a cup of cider, walk the maze, and absorb the change in seasons. This beauty lasts but a few weeks. We’ve been to that place, when they had the crab and the ravens. Thanks for reminding me. Sounds like a great Saturday outing. 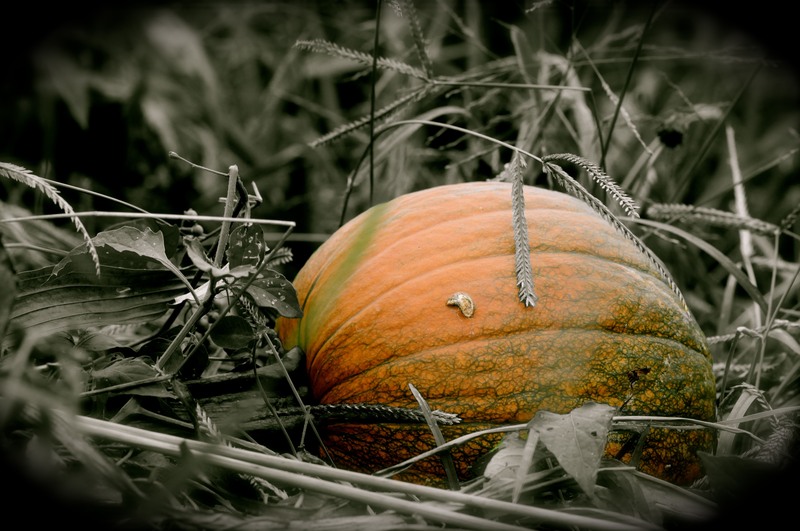 Love your pumpkin shot… and you photoshopped it! Love the processing.